Heirloom Cutting Mixture Leaf Lettuce | Gardens Alive! One of our research garden favorites, Heirloom Cutting Mixture has it all! A standout in the garden and on the table, this colorful, nutritious lettuce has a variety of textures. Contains batavia, butter head, iceberg, leaf, oak leaf, and romaine lettuce in an easy-to-grow heirloom mix. 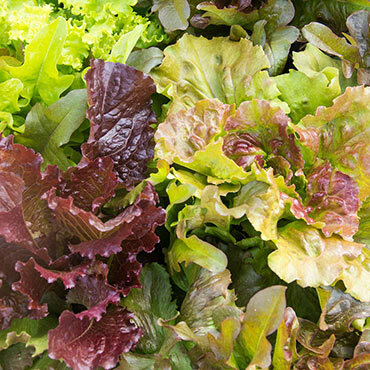 Choose light, rich, sandy, moist, well-drained soil in full sunlight for best results with these delicious lettuce leaves. They'll make delicious salads, attractive garnishes, or bring a tall burst of color to your favorite sandwiches. Remember that lettuce leaves are best harvested in the morning for peak sweet flavor and texture. The sugar content of lettuce fluctuates throughout the day! 28-80 days to maturity. Spacing: 12 - 18 inches between plants, 18 - 30 inches between rows. Foliage: Lettuce leaf in a beautiful variety of shapes and colors. Depth: At soil surface. (Needs light to germinate). Do not cover seed with soil. Soil Preference: Rich, light, sandy, moist, well-drained soil. pH 6.0 - 6.8. Neutral pH. Form: Upright leafy and heading leafy. Seed Count: Approximately 500 seeds per packet. Orders for in-stock seeds and hardgoods are typically shipped within 5 business days. Trees and shrubs are kept in the nursery row until fully dormant for optimum stress protection. In all cases, we choose the fastest, most efficient way to send your order—via the U.S. Postal Service or United Parcel Service. Large orders may be shipped in more than one package. Please note that we cannot ship outside of the continental United States.